No product creation. No customer care. Just promote affiliate products that you like and earn money. I assume that you’re making money already with affiliate marketing. You know what affiliate marketing is and how it works. 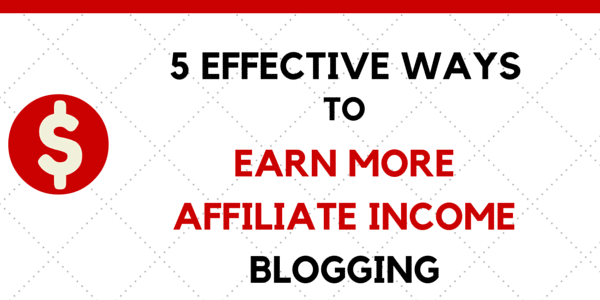 You’re well aware of the 5 must-haves for every blogger who earns with affiliate marketing. And you started a blog on which you want to make more affiliate income passively. How can I increase affiliate income on my blog? Let’s go through 5 quick tips to earn more affiliate income blogging smarter. It’s all about the right kind of audience…. We’re not going to chase traffic that do not convert. Nor promoting random products with no value or no trust. 100 targeted visitors a day can earn a full living online. Imagine that 1 out of 100 buys a $100 course from which you earn 50% as an affiliate. It’s $1500 from 3000 visitors a month. So, if you think you need huge traffic to increase your affiliate income, I am here to disappoint you. I am not going to tell you to invest in PPC advertising neither. The affiliate marketing course from Zac Johnson introduces affiliates to authoritative affiliate website if you need help. Here, we’ll level up a little bit to higher affiliate income with five+ smart blogging tips. Head these quick tips to earn more affiliate income on your blog. 1.- Use high paying affiliate programs. The first step is to use affiliate programs with higher commissions. 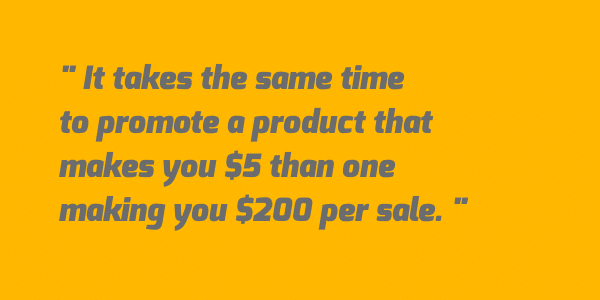 You spend the same time promoting a product that makes you $3 per sale than one making you $100 per sale. 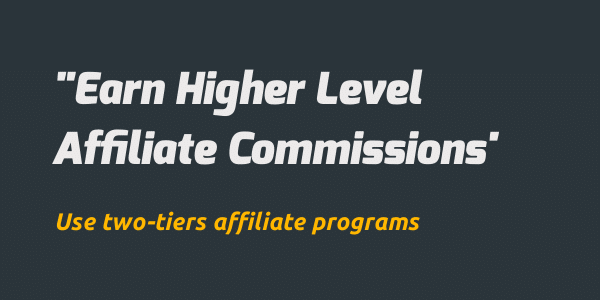 Think about which higher commission affiliate programs will fit your target audience. Is it a program that you use? Can you make tutorials about it? Can you recommend it in a list of useful tools? You can then convince someone to invest in a higher priced product for better results. 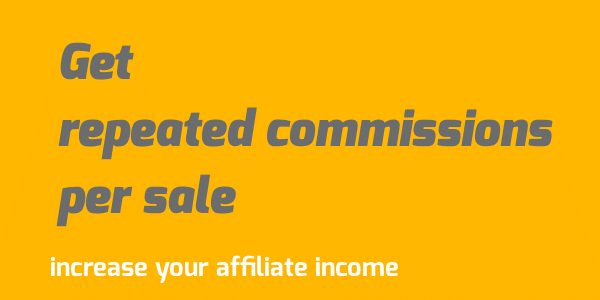 I make a list of top affiliate marketing programs with high commissions. Check it out. Find merchants that pay affiliates starting at $50 to $7500 per sale. Remember that only the programs that can solve your audience problems or feed their interests will make you money. So, to make more money with affiliate marketing, big commissions come from trust and need. People aren’t willing to invest in something they don’t trust and where it seems you have no experience with. At least, take a trial of a product you plan to promote to get to know it. 2.- Use residual income affiliate programs. 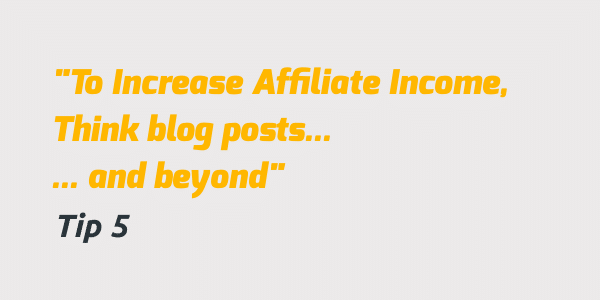 To increase affiliate income on your blog, you can use residual income affiliate programs. These programs make you repeated commissions from one sale. You increase your commissions each time you refer a new customer. But you keep making money from your previous referred customers. It is a smart way to make more income with affiliate marketing. Fortunately, there are a lot of legitimate recurring commission affiliate programs you can trust and promote. 3.- Use two-tiers affiliate and referral programs. To increase affiliate income while blogging, you can just get help from fellow affiliates. With two-tiers affiliate marketing, when an affiliate referred by another affiliate make a sale, both earn revenue for that sale. Some programs pay one time reward when the referred affiliate make a sale. Some others pay for repeated sales over a period of time. But some programs pay for each and every sale. It is lifetime two-tiers commissions. One problem with two-tiers affiliate marketing is when everyone wants to work as a recruiter. Nobody looks for making a sale, so no one makes money. Use two-tiers affiliate and referral programs to earn extra affiliate money, not as primary affiliate income source. From my experiences, 1 out of 20 referred users only will make money as an affiliate. But I do earn from those few successful persons. You can too. WPEngine: Join WPEngine affiliate program on ShareASale. Your primary goal will be to refer customers who will make you $200 minimum and up to $3500 per sale. (this is a truly great program). But you can refer fellow bloggers as affiliates and make $50 when they make their first sale. DMCA: DMCA is an online tool to protect your online content and take down your stolen piece. It pays affiliates $10 per sale and $0.25 per lead. Getting those commission will be your primary focus. In the meantime, if you know an affiliate who can make money through that program, suggest him to signup through ShareASale for DMCA affiliate program. You earn $3 when he makes a sale. And you’re both happy. StudioPress: This is a solid directory for well-coded themes where affiliates make 33% per sale. The two-tier affiliate option allows you to make $1 on signup + 3% when sales occur when you refer a successful affiliate. ShareASale: This is one of my favorite affiliate networks. I said why I love it in an earlier post. In addition to the money you make per sale, earn around $1 from each successful affiliate you refer. Another kind of programs which look like two-tiers which can help you increase your blog affiliate income is referral program. You don’t often refer customers. Instead, you refer money makers like you. And you earn a share of companies’ revenue over that online entrepreneur. Teespring: The Teespring invite program allows you to make $0.50 per t-shirt your referred sellers sell. It is itself a print-on-demand affiliate program to sell t-shirt without (required) investment. The seller makes his $3 to $12 per t-shirt based on volume and price that he set. You earn up to $2500 ($0.50 adds up) per designer you refer who makes money. Seoclerks: If you write about micro jobs like I did on my blog. You could increase income with SeoClerks. This is a marketplace for micro freelance services in the SEO field. They give you 50% of the 20% that they take on gigs. I made $200 in referral extra income already though small $1 to $10 tasks. So, two-tiers affiliate and referral programs can help you increase your blog affiliate income. You remember what I said about traffic needed in the introduction? Traffic is not what you’re looking for. You’re looking for conversions from the traffic that you get. You want your traffic to convert as much as possible. Recall the above example: 3000 targeted visitors can make you $1500. 6000 visitors in that category will make you $3000. To increase affiliate revenue on your blog, drive more traffic that converts. Targeting buyer intent keywords in your articles. Writing more blog post that converts into affiliate sales. Building a targeted email marketing list. Getting more blog traffic that converts with a smarter promotion strategy. 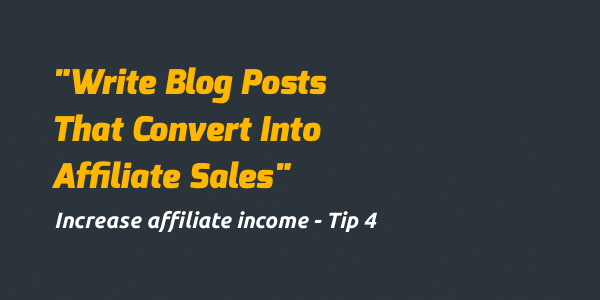 Are you making all your affiliate sales through blog posts? You can increase your affiliate revenue just by promoting through more marketing channels. Because a lot of people don’t like to read a lot, especially when they want to take actions. A large bunch of your potential customers will prefer to watch a video tutorial on YouTube and then take action. Or watch a slideshow on Slideshare and follow recommendations from slides. Just create content for such loved customers and increase your income. The good part is that such forms of content can be inserted into your blog posts for more blog authority, trust, targeted traffic and affiliate income. Do you think this article can help a friend, your network or you would like to save it for later? Spread the word on twitter, Facebook or Pinterest. This is not a complete list of tips to increase affiliate income on your blog. However, these five tips will make a difference if you apply them. Do you have a tip you would love to share or something that you particularly appreciate in the post?Share it with the world using the social sharing buttons. Thanks for sharing. It is a great help to me as I am starting joining an affiliate program.